While it’s almost the end of August, which means we are close to the end of summer I have yet to give up on summer cuisine! I’ll make the most of the great weather while it is still here. And take advantage of fresh summer ingredients! 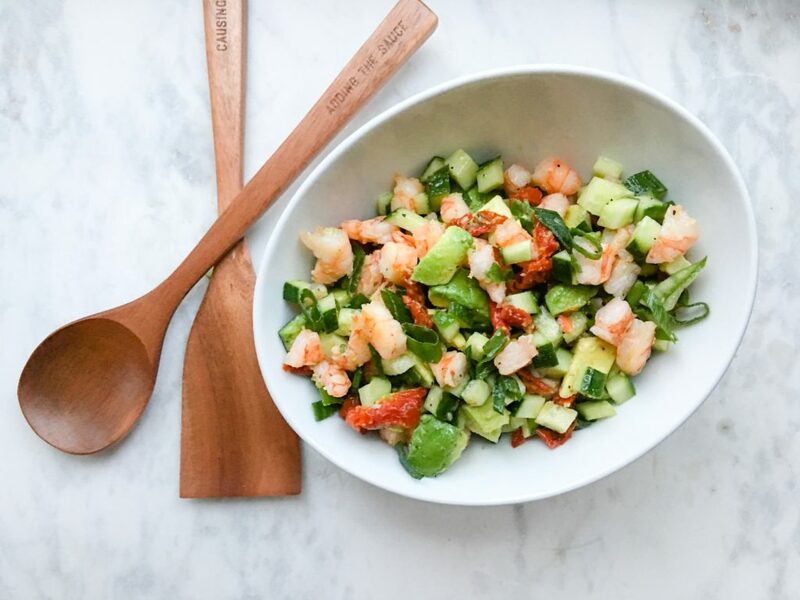 In the summer I am all for a refreshing salad and this Shrimp Avocado Salad is exactly that! I saw this recipe on the feedfeed’s instagram account (one of my fave food accounts!) and I had to recreate it. I tweaked some of the ingredients but LOVED every bite. If you are looking for the perfect summer dish this Shrimp Avocado Salad is a must! Start by thawing out the frozen bag of shrimp. Pour it in a bowl of cold water and let it sit for 4-5 minutes. 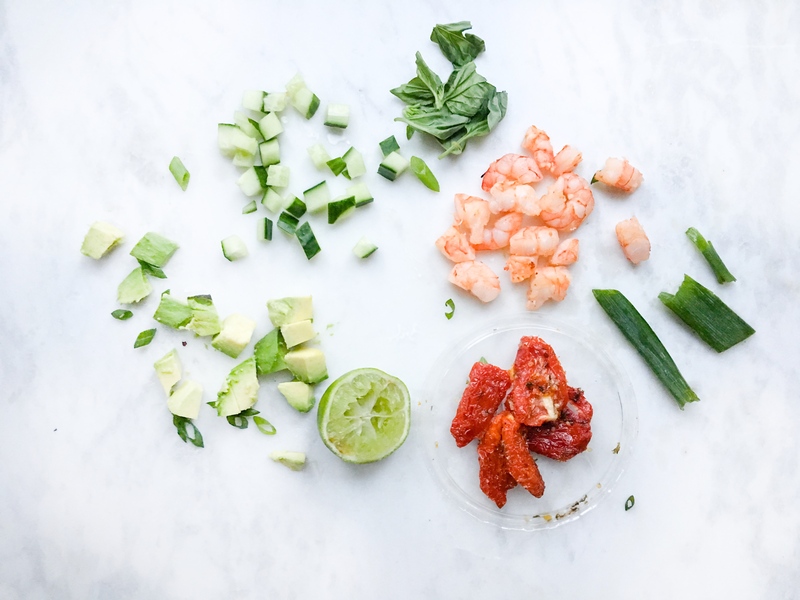 Once thawed out, peel the shrimp and mix in a bowl with Half a lime juice, garlic & 2 tablespoons of olive oil. Heat up a frying pan and once hot add the shrimp mixture plus salt and pepper. Once fully cooked (when shrimp turns pink), take them out of the frying pan and place on a cutting board. Let it cool down then chop the shrimp up into small diced pieces. Next dice the cucumber, green onion, avocado and sun dried tomatoes. Once all ingredients are prepped, throw them into a large bowl then add basil, remaining olive oil, half lime juice and more salt and pepper to taste. Mix it all together and voila!! The flavours in this salad come together so nicely and are even better the next day for left overs!